The recipe has to be easy! This is a hard recipe to mess up (and we love smart things like that in this house!). Here’s our video showing how to do it! 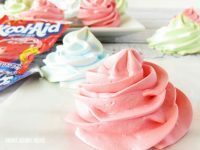 Here are our other Kool Aid inspired recipes! The neatest part about these meringue cookies are the shape because meringues are so recognizable. So, I highly recommend using the Wilton’s decorating set I mentioned above. However, your kids will still think that you are a pretty big deal no matter what shape they are served in. Depending on the age of your kids, they can make the cookies themselves once you’ve prepared the mixture! Older kids are more than capable of using the cake decorating set and tips, but maybe they have another plan in their head that would be just as neat. Have fun! Using an electric mixer, whip the egg whites until they become frothy (you will see lots of little bubbles). Depending on how many Kool-Aid flavors you wish to use, separate your mixture into even parts using small bowls. Add the Kool-Aid powder 1/2 tsp at a time until the desired color is reached. Remember, the Kool-Aid powder is potent, so a little goes a long way! Prepare your baking sheet with a layer of foil covered with non-stick spray, as seen below. Create an easy meringue cookie shape using either: Wilton’s Cake Decorating set, ziplock baggies with the tip removed, or using rounded spoonfuls. 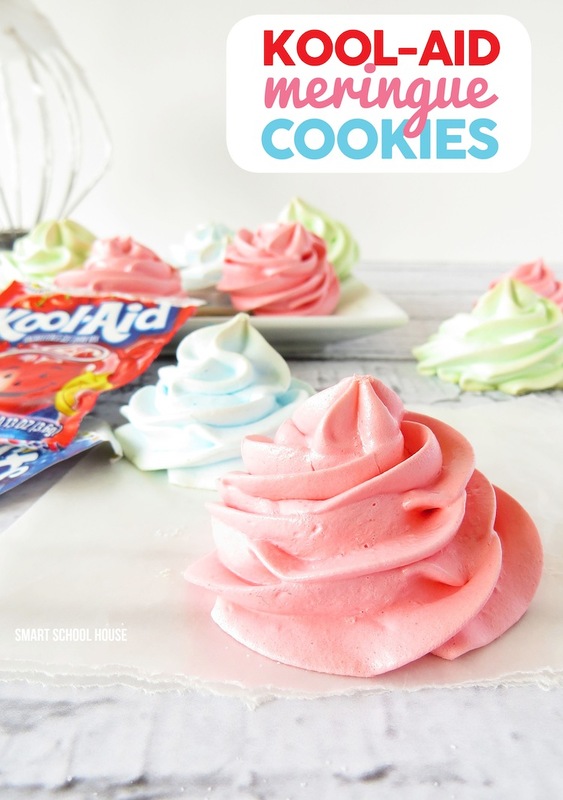 Place the Kool Aid Meringues into the oven pre-heated to 225 degrees. Bake them at this low temperature for about 45 minutes or until the tops become a little brown. Once they are completely cooled, they will harden and be ready to eat! Some will be sour, some will be sweet, but they will ALL be super cool! What is the cream of tartar for? It doesn’t I’ve used vinegar. It’s such a small amount. The third sentence after the list of ingredients says, Finally, mix in the cream of tarter.” Sometimes I read too fast and miss things too. Right after the sugar.It’s in the first paragraph. I tried this with splenda as we don’t use sugar. Wondering if maybe that’s why it was real twangy as I only used the amount of kool aid called for – any recommendations? as they aren’t even tolerable to eat. That could be the reason why. But, these meringue cookies definitely do have more of a tart taste:) Try adding vanilla or maybe real sugar. Or, feel free to get creative with it and try something new. That’s why I love simple recipes (they’re no-fail!). XO! I absolutely love your site!!! And this recipe. I am currently living in China and just ordered Kool-Aid over the internet since we don’t have it here (On in South Africa). Your blog is amazing! @ Geidy: Cream of tartar helps stiffen the egg whites. @ T. Kiser: Place the cream of tartar in the mixer with the egg whites. Good luck. Meringues are delicious. Is the temp Celsius or Fahrenheit? How many does this recipe make if you do the “swirls”? Like with the 1m tip? Mine was just a syrupy mess. It never frothed up??? I’m using a kitchen aid mixer. Any suggestions? My suggestion would be to turn up the speed on your kitchen aid and really make sure that you whip the eggs for a long time! Can I use boxed egg whites?